This 4-port charger lets you keep all of your mobile devices charged and ready to use, regardless of where you’re located. 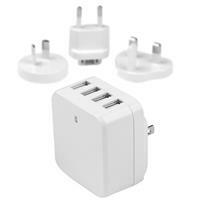 Whether you’re at home, in the office or travelling overseas, you can charge up to four devices at once. The wall charger includes a universal power adapter, which lets you plug into any electrical socket almost anywhere in the world. No matter where you’re travelling to, you can rest assured that you can keep your mobile devices charged and ready to use. Plus, its compact design makes this charger the perfect mobile accessory for storing in your carry-on luggage. The portable USB wall charger features a folding North American plug that tucks away nicely to fit inside your laptop bag or other carrying case. And, you can easily throw in the correct international plug for wherever you’re going, so that you’re all set to charge your device when you arrive at your destination. Keep the charger at your desk and use it as a dedicated charging station for your mobile devices, at home or in the office. Consolidating your USB devices onto a single multi-port USB charger offers a more efficient solution and saves space because you don’t need to use multiple wall outlets or power bars. (5 stars) One electrical outlet - 4 devices charging! 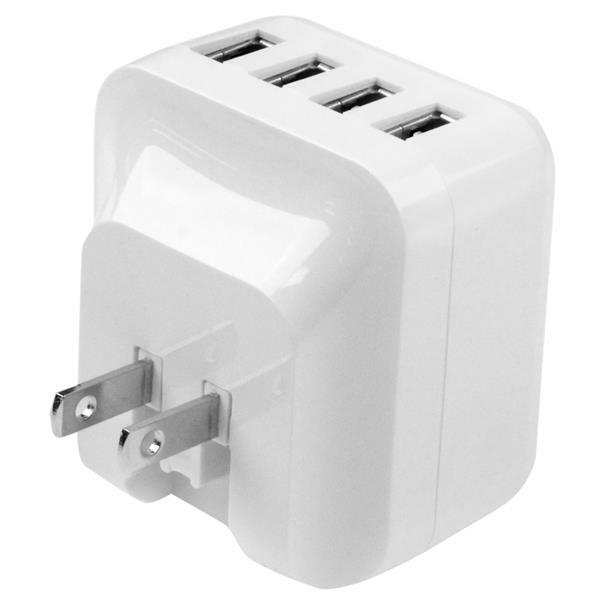 This 4-port usb wall charger (Product ID: USB4PACWH) uses one electrical outlet but charges four devices at once at a fast rate! 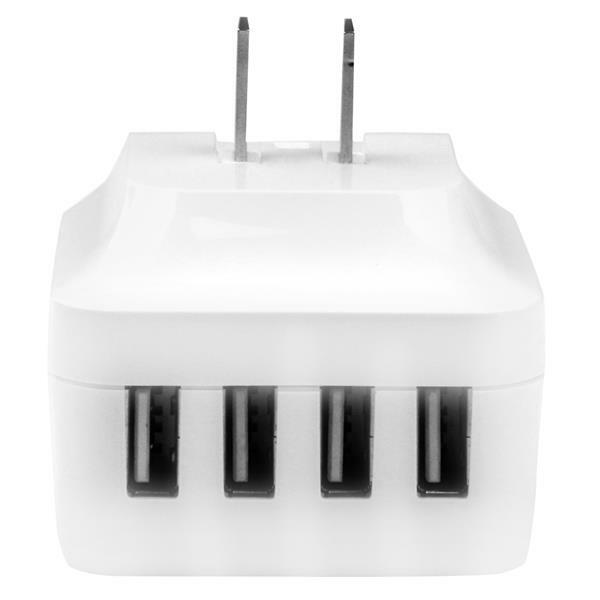 It comes with plug adapters for Australia, Europe and UK making it a must for the traveller on the go! Sharing 34w / 6.8a of power over four devices makes charging time a fraction of the wait to what we are used to. When you hold the 4-port USB wall charger you can feel that it is made for durability and the white LED that lights up when plugged in comes in handy as well. Another great product from Startech.com. I received this product in exchange for an unbiased review. I have been using this charger for a few weeks now without any issues. I have charged iPhones phones, HP tablets, Dell tablets, Nexus phones, Fitbit devices, kids toys and even running shoes. This product comes in a box with multiple connectors for different countries. The connector for North American wall outlets is built-in and can't be removed. When traveling, the North American plug folds down and the appropriate adaptor is slid overtop. The different plugs are not labeled, so I suppose if I were traveling I would need to bring them all in a little bag. This device charges everything I have connected very reliably. I have other 4-Port high output USB chargers that have difficulties charging some of the tablets I own. This device is listed as having 6.8A output and as long as the total power draw for all devices I connect is less, it seems to have no problems. The USB ports are not labeled and it doesn't seem to matter what devices you connect to which port (higher draw devices don't require specific ports). The only issue I have with this device is that it takes up a lot of space on the power bar. You cannot use the outlet above it on a power bar where plugs are vertically oriented and you cannot use the outlets on either side for powers bars that are horizontally oriented. It should go without saying that the outlet or two below this device will be covered by the USB cables. I wish there were more consideration for the outlets adjacent to this device on a power bar. (There are no issues with standard wall outlets as they are further spaced apart.) Overall I am really happy with this charger and will use it primarily over all other others I have. I received this product in exchange for an unbiased review. I have been in the technology business for over 35 years and for the past 20+ years I have been asked to provide unbiased reviews of various products from both the AV and IT world. In review of this product I have found that it does in fact charge two tablets and two cell phones simultaneously. The unit delivers a very fast power output required for each connected device, which is up to a total of 34 watts (6.8 amps) shared between all four ports. This product is a must for the sales or road warrior, especially one who travels internationally. 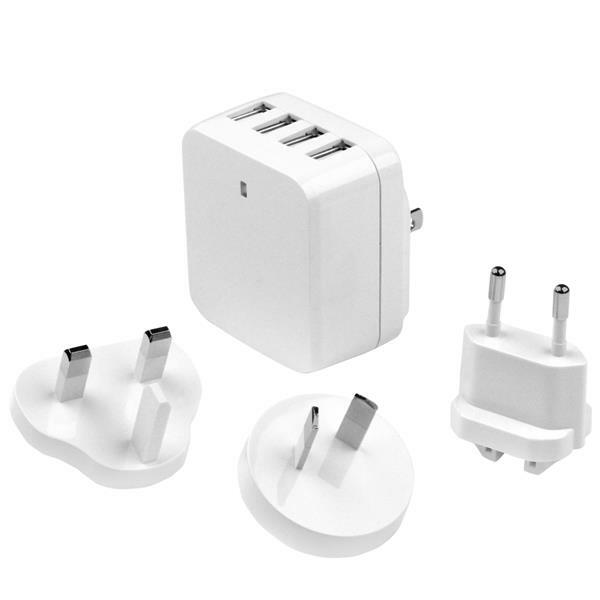 In the box: -4 Port USB Wall Charger -Plug Adapters for UK, Europe and Australia In summation, solid product, easy to use. I received this product in exchange for an unbiased review.